Last Sunday evening at about 7:20 p.m. I was in the Salt Lake City international airport, waiting for my wife to arrive from California. I was standing just outside the TSA security checkpoint, in the Delta terminal, reading a book to help pass the time. I heard a rather abrupt and hearty greeting issue from behind me, so I instinctively looked up. At that precise second, next to me in mid-stride was none other than Elder David A. Bednar, apostle of the Church of Jesus Christ of Latter-day Saints. I immediately recognized him as someone famous; he was smiling in acknowledgement of whomever had greeted him. If you hold your left arm out straight, he was literally as close to me as your left elbow is to you. Many of us, after a plane trip, are a bit disheveled. Not Elder Bednar. His grooming and hygiene were impeccable; I daresay that he had nary a hair out of place. I also observed that he is almost exactly my same height, 5' 8", or no more than an inch taller at most. As I said, I instantly recognized him as someone famous, but the recognition of specifically who he was hit me maybe a split second later, maximum. But within that brief window of time, I was struck by the amazingly high quality of the suit he was wearing. This rather surprises me, to be honest, since I was raised poor, am currently poor, and will most likely always be poor. Therefore, I have no sense whatsoever for "the finer things in life" or what exactly constitutes a top-quality item vs. merely a mid-quality item (since I have little experience with either). Yet, right after seeing his face, I was struck by just how, uh, nice (for lack of a better word) his suit was. He was wearing literally the best suit I've ever seen in my life, and that's no exaggeration. This thing positively radiated quality. It was jet-black, or very near unto it, and, like its wearer, was immaculate. Forgive me for being so redundant on this one subject, but I'm literally confused, even now, by how much of an impression something as mundane as the quality of a suit could make on me. Like I said, typically I can't discern such things, but for some reason this detail stood out. I can't explain it, and it's aggravating me. Anyway, let's move on. I of course did a double-take, turning around to get a second look once, like I said, I recalled specifically who he was. I saw two "handlers" who had come to greet him; perhaps one of them was his chauffeur, perhaps they were both from church security, who knows? They were both male and they both seemed to be wearing suits of similar, if not identical, color and quality. I didn't hear the specifics of their conversation, but in the midst of additional cordial greetings they turned around and headed toward the parking garage. I got the impression that this sort of thing was a very routine "business as usual" occurrence for them. Elder Bednar held himself ramrod straight. Unlike many passengers after a flight, there was no stooping or dragging of feet from him! Now that I mention it, I didn't detect a hint of fatigue, either. I made it a point to visually compare him to the folks who were in the coiling line a few feet away from him, the ones in line for the TSA security checkpoint before boarding their flights. For some unfathomable reason, he simply was not just another one of the unwashed masses. He seemed distinctly apart from those close by him, like he was a different caliber of humanity entirely. Don't make the mistake of thinking that this was because he acted "high and mighty"--he most certainly didn't--he just seemed to possess an involuntary aura of "in the world, but not of it," again for lack of a better phrase. I literally can't explain it. Must've been the suit. Anyway, I'm a bit taken aback by all this, because as a grizzled apostate I thought for sure I couldn't possibly be impressed by LDS royalty anymore. Who knows, maybe this is all symptomatic of being "star struck" to some extent, because let's face it, he is, literally, a celebrity among millions of Mormons and ex-Mormons alike. Or could it be the fact that most encounters with apostles take place in controlled environments, whereas this one was in the wild? To sum up, Elder Bednar made a distinct impression on me, but, apostate that I am, I'm left scratching my head wondering how and why this is so. "[O]nly in Mormonism would a trained therapist recommend psychiatric treatment for subjects who don't hear voices in their heads." which is what he really was called to do, if he was truly called of God. I know nothing about who David Bednar is, but there was a David Bednar in chat yesterday. We didn't discuss much although I think he may have had a longer and more productive conversation with Nightlion and a couple others. I met L. Tom Perry once. It was nothing like your encounter. It was in a stake center, and nothing about him stood out particularly. He seemed to be more of a regular guy. Thank you for sharing this personal experience, Shades. Do you think it within the realm of possibility that you had a "spiritual" experience of some sort? I doubt everybody who saw Elder Bednar that day was impressed the way you were, Shades, so this may say as much (or more) about you than it does about Elder Bednar. Do you think it possible that God is feeling after you? I hate to be the one to ask this, but it seems the obvious question . . . Being called of God requires the wearing of robes and a beard? Seems like an important thing to leave out of scripture if true. I have met Perry before too. He seemed pretty nice and approachable. I have never met Bednar, but based on the stories I have heard and his confernence talks, it seems that he has a rather high opinion of himself. This God sounds kind of dirty... I don't want some supernatural force "feeling" after me. Unless God is some hot super model then I would be down for that. I think he means servants of God should be dressed humble. I don't see how this is different than any celebrity encounter, whether you like the person or not. Of course, the only way it can have an effect is that you recognize the person as a celebrity. And that would be different depending on what subcultures you identify with. I'm sure that a person who is really into rap music might have a similar reaction to other rap stars, even if it were a rap artist they don't particularly like. I don't see how this is different than any celebrity encounter, whether you like the person or not. I feel certain only Shades can answer that question for himself. And it seemed to me from reading his OP that Shades was approaching this in a very logical manner, taking into account the "unexpected celebrity" factor, and even so was left scratching his head over what he experienced. Shades knows Mormonism as well as anybody, and he knows all the stories Mormons tell about meeting general authorities and how they felt they were special in some undefinable way. Because of this, Shades would be the last person in the world to think such an experience would happen to him. And Shades is honest enough both with himself and with the board to post about it publicly. I know what you mean. It isn't easy putting these things into words, but I prefer that expression to the one about the "tentacles" of redeeming love. I have an aversion to tentacles of any form. I recall bumping into Jay-Z about ten years ago in Chicago. Still scratching my head about it. I was walking the streets enjoying myself when I felt a need to use the restroom. I entered the doors of some fancy hotel, sat upon one of the finest toilets my caboos has ever graced, relieved myself to my hearts delight, and upon leaving, just outside the fancy restroom, I bumped into him and his entourage. No big deal. I don't even know much about the dude at all, but for some reason it was something to me. I noted his fancy clothes too. I ain't nuttin'. don't get all worked up on account of me. Shhhhh! What happens in chat, stays in chat! oh come on, I purposefully saved you from the detail that constituted the rigorous events that was my number 2 that day. Ah well, can't please them all, I suppose. I've figured out where you live Shades. The missionaries should be arriving some time this evening. I saw two "handlers" who had come to greet him; perhaps one of them was his chauffeur, perhaps they were both from church security, who knows? They were both male and they both seemed to be wearing suits of similar, if not identical, color and quality. Makes me wonder if the suits were paid for with tithing, because surely a chauffeur and/or body guards don't make enough to be able to afford top quality suits. I'd like to know where this is from; I found it years ago on some blog with no attribution. I tried a reverse image search, too, with no luck. 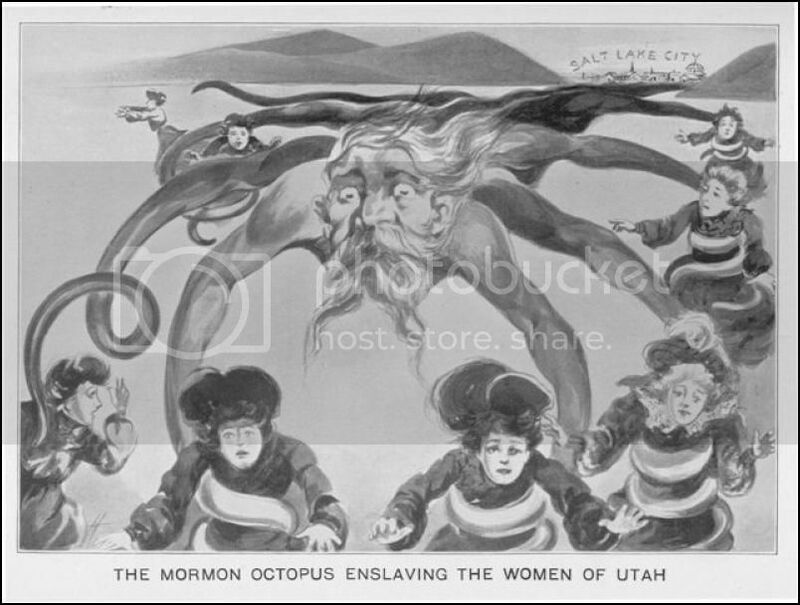 I believe there is a book length study of anti-mormon/anti-polygamy political cartoons. Perhaps it's cataloged in there. If I ever run across it, I'll check.